It was a fairly quick turnaround for development and implementation, and that really allowed me to take a deeper dive into the informatics world and to see and understand the intersection between technology and the caregivers. We’re trying to see where the world wants to go over the next 10 years, and try and skate to that point. It’s interesting being in an organization that’s really not trying to play catch up, but trying to set the standards and to set the direction of an industry. There’s no magic to it. It’s about communication. It’s about transparency. It’s about bringing the end users into the process, and it’s about persistence. We don’t offer anything externally that we don’t actually embrace or trial or approve internally, and I think that gives us a great deal of credibility. Gamble: How long have you been at the Cleveland Clinic? Krieger: I’ve been here about a year. It’s a relatively short period of time. Gamble: I see that you have a background as a plastic surgeon and worked as a clinical informatics consultant. I just wanted to talk a little bit about what made you interested in the informatics field, and what drove you to where you are now. Krieger: My background is, as you said, based in the clinical world. I was in the military for about 12 or 13 years, and then left and entered into private practice in Northern Virginia. I was in private practice there for 17 or 18 years. It was a clinical practice; I was a solo practitioner practicing plastic surgery but I’ve always had an interest in informatics and an interest in technology, and in my own small world in my office, I implemented a number of systems and was involved in beta-testing of some systems over the years. Over time I became more involved with technology. 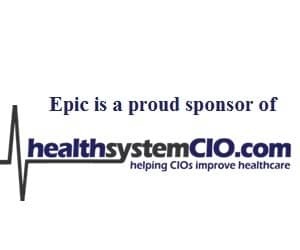 As our own local health system that I worked with in Northern Virginia — Inova Health System — started to ramp up to implement its own EHR system and they were doing an Epic implementation, I became involved with that and became the lead for physician engagement and change management for the system. Over a two-year period, we implemented Epic at five hospitals and roughly 200 ambulatory sites. It was a fairly quick turnaround for development and implementation, and that really allowed me to take a deeper dive into the informatics world and to see and understand the intersection between technology and the caregivers. I was the end user that I was trying to engage, so it really gave me a good window on how to best engage the end users, how to best engage the physician staff in particular, and hopefully, lead to a more successful implementation. Along the way, I also decided that it would be helpful to have more formal training around informatics and business, and so I spent a year at Duke. Duke was offering a relatively new degree that they called the Master of Management in Clinical Informatics and this is a program that was jointly sponsored by the Fuqua School of Business and Duke Medicine. Think of it as combining the core curriculum of an MBA program with a core informatics curriculum, the result of which is a program that focuses on the use of informatics as it applies to the business of medicine and how to improve processes around delivery of healthcare. I did that, and somewhere along the way found myself here at Cleveland Clinic. Gamble: So it’s been about a year. How has it been for you so far? What do you like most about being there? I can imagine that’s a really interesting place to work. Krieger: I feel very fortunate to be working with a group of people that I’m amazed by day to day. The depth of talent here is really pretty incredible, and to be part of that and to be part of an organization that I see as really on the leading edge of health informatics is very exciting. We’re doing a lot of things. We’ve spent 10 or 12 years as an organization trying to lead the way in health informatics, and now that we’re where we are, we’re trying to see where the world wants to go over the next 10 years, and try and skate to that point. It’s interesting being in an organization that’s really not trying to play catch up, but trying to set the standards and to set the direction of an industry. Gamble: I can imagine. Innovation seems to really be something that’s very much present there. How does the leadership at Cleveland Clinic work to foster that innovation and not force it? How are you able to do something like that? Krieger: I think some of it has to do with the nature of the people that come here. They tend to attract people that are attracted to that innovative way of approaching things. They also provide tools and encourage people to look at things in an innovative way and to develop innovative ideas or innovative products. We have an innovation center that helps caregivers develop ideas into, whether it’s products or companies, and really enables things to go from concept to actual end product. I think by having that infrastructure to support your providers and to support all your clinicians, it allows for a very free flow of ideas among providers, and then allows them to actually take action with those ideas because they have the toolset at their disposal to do something with those ideas. I think that’s a big part of why as an organization it’s been so innovative and successful. Gamble: Okay. So you talked about how you’ve had some focus on position engagement and change management with implementations. With the CIOs we speak to, those are two of the topics that come up a lot, especially change management and handling that piece. I was just wondering if you have any words of wisdom or pieces of advice for CIOs who are dealing with challenges there, and ways to help improve that engagement among the clinicians and help them through the changes. Krieger: There’s no magic to it. It’s about communication. It’s about transparency. It’s about bringing the end users into the process, and it’s about persistence. We talked about communication or delivering messages around, for example, an EHR implementation. You can’t repeat the same thing enough times, because no matter how many different ways you communicate an idea through whatever medium, there’s always going to be a large section of your audience that either isn’t going to hear it or maybe doesn’t want to hear it. It’s only through repeated efforts and persistence that the messages get delivered. You just have to be persistent and you have to be organized and you have to be directed at a goal, but there’s no magic to it. It’s just about being persistent and understanding of the needs of the audience. Gamble: Just looking down the road the next year or so, as far as your main focus, is it about continuing to develop the external business and looking at M&A and keeping abreast of what’s happening there? Krieger: It’s really continuing with the things that I’ve been working on these past months. There are certainly lots of opportunities for the clinic out there, and it’s just making the most of those opportunities as they come up. As a group internally, we’re continuing to develop in MyPractice or Epic platform, and as those capabilities develop and we enable them internally, then we’ll take those capabilities and offer them externally, but I think that’s really the key to the things that we do externally. There’s a saying, “You have to eat your own cooking.” We don’t offer anything externally that we don’t actually embrace or trial or approve internally, and I think that gives us a great deal of credibility when we go talk to other health systems or to other organizations about how to do things or how to use certain tools, because it’s something that we’ve actually done and actually been successful with. Gamble: Absolutely. All right, well that covers what I wanted to talk about. I appreciate your time. This is a really interesting perspective and I think it’s going to be very beneficial for CIOs to hear about what you’re doing and to get your perspective. Thank you so much for your time. Krieger: Happy to talk with you, thank you. Gamble: Good luck with everything, and I hope to catch up with you again down the road. Krieger: Thank you. Take care.